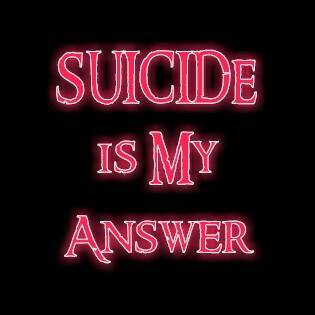 mumbled "I give up so suicide is my answer "
Suicide is not gonna help??? Live with GOD!!! Pursue a new life with him!!!!!!!! I AM BEGGING YOU FOR GIDS SAKE DONT CUT!I GET LIFE IS HARD AND REALLY RUDE BUT MY FATHER NEVER WANTED ME SO I WAS LIKE A MISTAKE TO HIM BUT I NEVER CUT BECAUSE I KNEW THAT HE ISNT WORTH IT.THEY ARENT WORTH YOUR TEARS.THEY ARE GAINT PILES OF POOP IF THEY THINK YOUR WORTHLESS BECAUSE GUESS WHAT?YOUR NOT WORTHLESS YOU ACTUALLY ARE WORTH A LOT.THEY WILL NEVER CARE AND THATS FINE BUT THERE ARE PEOPLE WHO WILL ALWAYS CARE.AND YOUVE GOT TO REALIZE THAT.Please Im begging you dont cut.Please. i understand, Des. I've broken that promise before, too. Just try not to do it again, okay? mumbled "Here is my final good-bye"
mumbled "She left me so here comes goodbye "